China’s less-affluent rural population is increasingly taking to the Internet and smartphones to buy and sell goods, according to statistics released this week at a rural e-commerce summit co-hosted by Alibaba Group. The number of online shoppers in rural areas increased to 77.14 million in 2014, expanding 40.6 percent year-over-year, Alibaba officials said, citing figures from the China Internet Network Information Center (CNNIC). At the same time, the availability of cheaper smartphones is encouraging rural residents to shop online with their handsets, driving e-commerce into poorer, more remote parts of the country where there is a lack of physical stores. Mobile e-commerce spending by rural Chinese consumers on Alibaba shopping sites Tmall.com, Taobao Marketplace and Juhuasuan last year grew in excess of 250 percent to more than RMB 200 billion ($32 billion). Of the top 100 counties with the highest mobile growth in Gross Merchandise Volume (GMV), 75 were located in China’s less-developed central or western regions, according to Alibaba. E-commerce in China’s rural areas is still small potatoes compared with online shopping in China’s wealthier coastal cities. In first quarter of 2015, less than 10 percent of online purchases made on Alibaba’s China retail marketplaces were shipped to rural areas. Alibaba sees rural China as a vast and largely untapped growth opportunity. At the end of 2014, there were just 178 million Internet users in rural China, fewer than one out of every three rural residents, according to CNNIC. In China’s cities, nearly two out of three residents use the Internet. 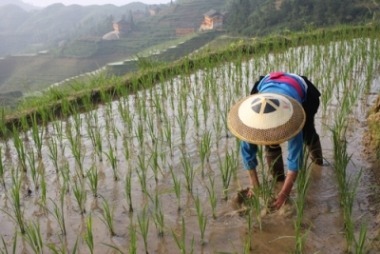 An estimated 600 million Chinese live in rural areas. In order to spread e-commerce throughout China, Alibaba Group in 2014 embarked on a RMB 10 billion ($1.6 billion) program to build 1,000 county-level Taobao Rural Service Centers and 100,000 village-level Taobao Rural Service Centers over the next three to five years. At the end of June, 63 county-level centers and 1,803 village-level centers were open in 17 provinces. To watch a video showing how Taobao’s service centers and Alibaba’s logistics arm Cainiao enable rural e-commerce, click here. At Alibaba’s Rural E-commerce Conference held July 8 in Tonglu County, Zhejiang Province, Alibaba Group CEO Daniel Zhang stressed that the Internet is not only about selling to rural residents. E-commerce also offers opportunities for young people from rural regions to start their own online businesses. The company said mobile GMV of online stores operated by rural sellers exceeded RMB 120 billion ($19.3 billion) in 2014, growing more than 300 percent year-over-year. Alibaba hopes to promote further growth through a program started in May to cultivate 100,000 “Rural Taobao Partners,” targeting mainly Internet-savvy young people who left their home villages to find jobs but now want to return home. These partners are using Alibaba marketplaces to find wider markets for regional products, among other activities. In May, 20 members of the first batch of Rural Taobao Partners earned more than RMB 5,000 ($806) each, the company said, with the most profitable partner earning RMB 16,000 ($2,578). “We will give (young people) the tools and build the stage for them to go back to their home towns to start their own businesses,” Zhang said at the conference. “As long as you are familiar with your home region and have a passion for serving consumers, and as long as you have the wisdom and foresight to run your own business, we can help you serve the rural region,” he said. In first quarter of 2015, 9.64 percent of parcels generated via Alibaba’s China retail marketplaces were shipped to rural areas, compared with 8.65 percent in the first quarter of 2013. In 2014, 4.5 billion parcels generated via Alibaba’s marketplaces were shipped to and from rural areas. Last year, online spending by rural residents grew at a rate that was 18 percent faster than the online spending growth rate in cities. GMV of Taobao/Tmall shops owned by e-tailers in impoverished counties in China last year grew 58 percent to more than RMB 12 billion ($1.93 billion).